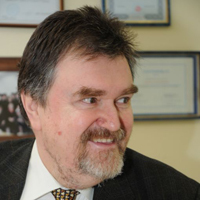 Professor Dr. Alexander Khoroshilov is the Officer-in-Charge for UNESCO IITE. He holds a PhD and is a well-known scientist and specialist on ICTs, mathematical modeling and statistics. He has over 40 years of deep professional experience in the field of ICTs and education (strategic development and management, capacity building and professional development, coordination of scientific-educational projects) including that at the international level. Besides he has an extensive experience in provision of advisory services to education policy makers. He was graduated from Moscow State University of Economics, Statistics and Informatics (MESI) in 1975, where he then worked until 2007 on various positions – from software engineer to First Vice-Rector. In the period from 2007 to 2010 he worked at Academy of Labor and Social Relations as Vice-Rector and at Moscow State (Lomonosov) University as professor. Since August 2010 he has been working at UNESCO Institute for Information Technology in Education (IITE) on the position of National Programme Officer responsible for teachers’ professional development based on ICT, OER and ICT competency standards as well as for networking and partnership with public and private sectors. Since December 2014 Professor Khoroshilov is Officer-In-Charge of IITE.